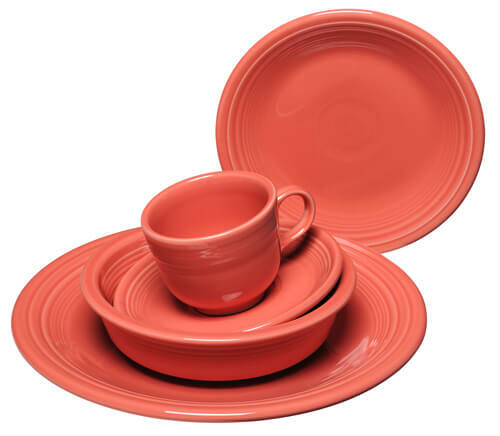 April 2014 Update: According to the Homer Laughlin Company, the company’s Flamingo pink colored Fiesta dinnerware has been discontinued because Flamingo has not been selling as well as some of their other dinnerware colors. 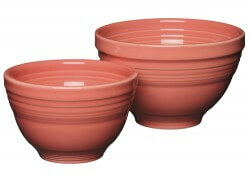 Each spring, The Homer Laughlin Company launches a new color of Fiesta dinnerware. 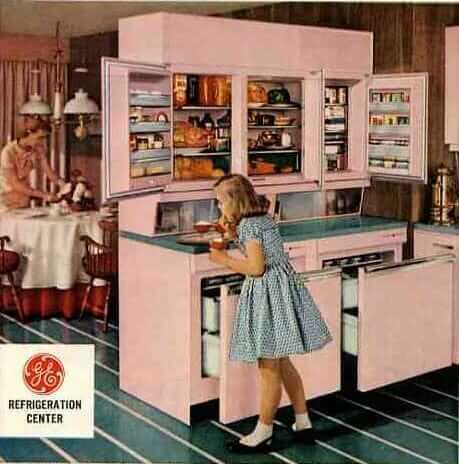 Apparently, people have been requesting some sort of pink for many years now. The reason it has taken so long is because they have been working on perfecting the glaze. Producing the Glaze: Fiesta Dinnerware is fired at an extremely high temperature, making it the most durable casual dinnerware on the market today. Because of this high-fired process, certain colors can be very difficult to make, for instance, any shade of pink. All glazes utilize various metals to form their vibrant colors. Incidentally, pink hues require significant amounts of gold, which can make it very costly. The color specialists at Homer Laughlin have spent several years working with different ingredients to develop the glaze recipe that enables the Flamingo hue to come alive on the dinnerware – and at the standard Fiesta price point. “There is an art to developing just the right shade to fit in with the other colors. It’s also important to have consistency in the color, no matter how many pieces of ware we make,” explains Rich Brinkman, VP of Sales & Marketing for Homer Laughlin. Color Combinations: Flamingo will join the lineup of Fiesta’s iconic colors, some of which have been in production since the reintroduction of the line in 1986. Forty-three colors have been produced since the brand was launched in 1936 – more than 75 years ago. The entire 2012 spectrum includes: White, Black, Shamrock, Cobalt, Peacock, Turquoise, Paprika, Marigold, Lemongrass, Ivory, Sunflower, Tangerine, Flamingo, Scarlet, and Plum. With the introduction of Flamingo, Chocolate will retire. Flamingo lends itself to a wide variety of versatile color arrangements, on trend with the latest in fashion and home decor. Citrus Palette: One of the hottest color combinations for 2012, the citrus lineup includes Flamingo, Marigold, Sunflower, Tangerine, Ivory, Lemongrass, with accents of Shamrock, and Peacock. This palette evokes the optimistic cheerfulness seen on the runways and in high-fashion for the last few seasons – and now it’s making its way into the home. Retro Chic: With a touch of whimsy and a nod to nostalgia, go retro with a combination of Flamingo, Turquoise, Scarlet, and Ivory. High Fashion: Feature bright tones of Flamingo, Tangerine and Peacock. Modern Sophistication: Sleek and formal, dine in modern sophistication with Flamingo, Black and Ivory. Back to Nature: Flowers make everyone smile. Why not bring those smiles to your tableware with a color palette inspired by nature? Combine Flamingo with Shamrock, Lemongrass and Ivory. Above: Fiesta Canisters. 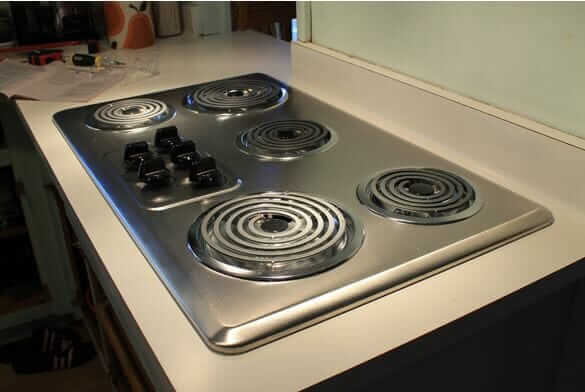 Photo used with permission from the Homer Laughlin Company. My collection of Fiesta dinnerware includes many pieces in tangerine, sunflower, shamrock, scarlet, turquoise and peacock…and hopefully I’ll soon add some Flamingo! Fiesta dinnerware is fun to collect and use — whether you collect the vintage or the new. Personally, I collect new Fiesta dinnerware because of the ease of locating it, the affordable price and the great collection of colors currently available. When my husband and I got married, instead of registering for fancy fine china, we chose a more modest and utilitarian route and registered for Fiesta dinnerware. Our Fiesta dinnerware collection is used both daily and for entertaining. We’ve never regretted our decision to collect Fiesta dinnerware, and it comes with the added bonus of being made right here in the USA! We hear the question about lead in Vintage Fiesta (1936-1973) almost every day and it is always asked as if Fiesta had been the only dinnerware to ever contain lead in the glaze.The truth is that ALL OLDER CERAMIC DINNERWARE had lead in the glaze. MOST dinnerware made today still has lead in the glaze. In the early 1980s, The Homer Laughlin China Company made the decision to make all of our products lead-free. Fiesta was re-introduced in 1986 and has been lead-free since that time. By 1992, all glazes and ceramic colors produced by our company were lead-free. Prior to about 1930, lead release in ceramic dinnerware was unregulated. We have to assume that some dinnerware was safer (or less safe) than others. We don’t really know the amount of lead release in all older dinnerware. What we do know is that your ancestors and mine used ceramic dinnerware all of their lives with presumably little or no ill effects. But can we be sure? At Homer Laughlin, we have had our older dinnerware tested for lead release and found it to be relatively harmless. 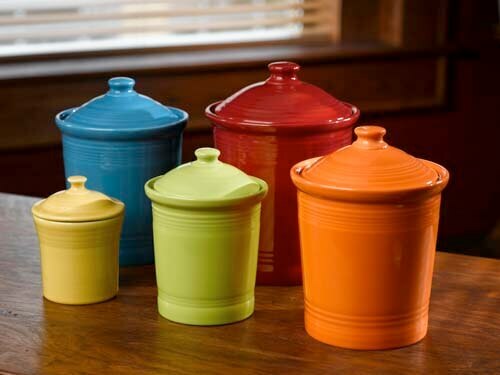 We usually advise people that our older dinnerware is safe for everyday dining. However, we don’t recommend using it for long term storage of highly acidic foods (orange juice, tomato sauce, etc.) since the leaching of lead is a possibility, especially when the glaze shows evidence of crazing. Microwaving older dinnerware is not advisable. Our original Fiesta Red (actually orange) color was introduced in 1936 and did contain a small amount of uranium oxide in the glaze. (Yes, it will register on a Geiger counter.) This was not unique to Fiesta. In fact, many dinnerware manufacturers used uranium oxide in their glazes at that time. To name just a few that I know were using it were: The Edwin M. Knowles China Company of Newell, West Virginia, The Taylor, Smith & Taylor Company of Chester, West Virginia, The Paden City Pottery Company of Paden City, West Virginia and Cronin China Company of Minerva, Ohio. It is not true that our Fiesta Red dinnerware was removed from the market because of any perceived danger. It was discontinued in 1943 because the U.S. Government stopped all civilian use of Uranium Oxide at that time. They were using all available material for the “Manhattan Project” (the development of the Atomic Bomb). After World War II government restrictions were relaxed and civilian use was again permitted. We re-introduced Fiesta Red in 1959 and produced it until 1972. There has never been any government study that indicated any danger in the use of uranium oxide in dinnerware. Thanks to Dave for taking the time to clear that up! I think we can all breathe a bit easier next time we find ourselves in close proximity to vintage red Fiesta! Pam interjects: Readers, you probably know what I am going to say: If you use vintage dinnerware, it’s up to you to consult with properly licensed experts to determine what’s in the glaze and how you would like to handle. 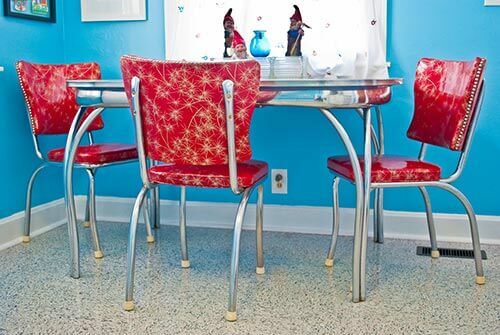 Owners of vintage Fiestaware, you now have some information from Homer Laughlin Co. on their old glazes — but it still is up to you to make your own determination on how to handle including consulting with properly licensed professionals. 1840s The pottery industry in East Liverpool begins with the manufacture of yellow ware from the rich deposits of local clay. 1870-1879 Public preference shifts to a more sophisticated white ware imported from England. The Laughlin Brothers (Homer and Shakespeare) build a two-kiln plant on the banks of the Ohio River to produce white ware as the alternative to yellow. Shakespeare pursues other interests; thebusiness continues under Homer’s direction and becomes, The Homer Laughlin China Works. 1897-1899 Homer Laughlin becomes one of the better known manufacturers of ceramic dinnerware and toilet ware in the country. A young bookkeeper from Steubenville, Ohio, William Edwin Wells, is hired tomanage the books and eventually, business. 1897-1899 Homer Laughlin retires and sells the business to Wells and a financial partner, Louis I. Aaron of Pittsburgh. Two more plants are built to support operations. 1902-1909 A tract of land on the opposite side of the Ohio River (today known as Newell, W.Va.) is purchased from the Newell family. Plant No. 4 is built, bringing production to 300,000 pieces per day. The company officially moves its headquarters and operations to the Newell location. 1910-1914 Louis Aaron retires and is succeeded as president by his son, Marcus Aaron. Plant No. 5 opens with 16 additional kilns—78 ware and 60 decorating. 1920-1928 Homer Laughlin replaces intermittent kilns with continuous firing tunnel kilns at Plant Nos. 4 and 5—to increase production. New Plant Nos. 6 and 7 open. Plants on the East End are phased out in favor of the largest Homer Laughlin plant—No. 8. 1927 The company hires Frederick Hurten Rhead as design director. Rhead embarks on Fiesta—his most noted accomplishment. 1930 W.E. Wells retires, and is replaced by his eldest son, Joseph M. Wells, Sr.
1936 Fiesta is introduced in five initial colors – Red, Yellow, Cobalt Blue, Green and Ivory – at the Pittsburgh China & Glass Show. 1938 One million dozen pieces of Fiesta produced! 1940-1949 World War II begins. Homer Laughlin produces china for the armed forces; post-war production peaks—the company employs 3,000. 1950-1959 Fashion dictates a change in Fiesta’s color palette—softer pastels emerge. Low cost ware imports force companies out of business; Homer Laughlin shifts its focus to the hospitality market and introduces “Best China” brand vitrified hotel china. J.M. Wells, Sr. retires, turning over the management of the company to the third generation of his family—Joe Wells, Jr.
1980-1985 The company begins to produce lead-free china for the hospitality industry—setting an industry standard and the stage for today’s Fiesta. Fiesta Bakeware. Photo used with permission from The Homer Laughlin Company. 1986 Fiesta is reintroduced, lead-free, in new, updated colors. Joe Wells, Jr. retires and is replaced as executive vice president by his son, Joe Wells III. 1987-1997 In Fiesta fashion, new colors debut, while others retire. Limited collections are produced in Lilac and Chartreuse. Sapphire is exclusive to Bloomingdales. L. Aaron retires as president and is succeeded by his son, Marcus (Pete) Aaron II. 1997 The 500 millionth piece of Fiesta is produced. Five hundred numbered Raspberry Presentation Bowls are produced to commemorate the event. 2000-2005 State-of-the-art computerized kilns are installed throughout Plant Nos. 6, 7 and 8. New forming and glazing equipment is installed and a self-contained “plant within a plant” is built at Plant No. 8. Joe Wells III, with his sisters, Jean Wicks and Elizabeth McIlvain, purchase stockholder interests. Joe Wells III is elected president and chief executive officer. …more new Fiesta colors debut…more retire. 2007 Evergreen emerges on the Fiesta color palette—Periwinkle retires. Fiesta makes the transition to a lifestyle brand with new items like bakeware, glassware, table linens and more! 2008 Homer Laughlin gears up for its 75th Anniversary year with a new item and color—3-Piece Baking Bowl Set in Marigold. Ivory makes a comeback! Fiesta Persimmon retires. New fall color debuts (Chocolate), along with new shape: Square. 2009 2006’s Heather is the retiree—Lemongrass is introduced. The second item in the 75th Anniversary series is unveiled: a large Oval Serving Platter. 2010 Homer Laughlin introduces a new collection: America’s Diner/Bistro, based on its original checked and banded patterns produced in the mid 1900s. Paprika is the new color! Evergreen and Cinnabar retire. The third item in the 75th Anniversary series is introduced: 2PC Prep Baking Bowl Set. 2011 The official 75th Anniversary year! 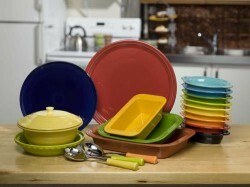 Dinnerware collection available in limited edition anniversary color, Marigold, as well as limited edition Soup Tureen. 2012 Flamingo is introduced; Chocolate retires. Thank you for the Flamingo info. Guess who’s going shopping now? I love my Fiestaware – I use it every day. 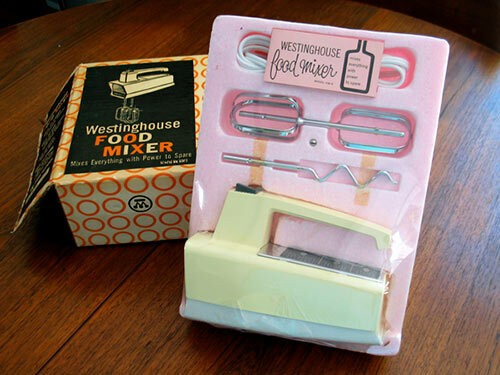 Like someone upthread said – they are happy dishes! I even talked my Mom into replacing her brand new white Nautica set with happy, happy Fiestaware and now they are her everyday dishes too. By the way, I have service for 4 of the, ahem, “America’s Diner/Bistro, based on its original checked and banded patterns produced in the mid 1900s.” and they are super cute! Heavy white diner dishes – makes me feel so “Nighthawks” while drinking my coffee. If I wasn’t already over-extended in the dish department I would have bought more. It’s like a family problem – my Mom has, um, seven sets of dishes? I have four – regular Fiestaware, the diner Fiestaware, service for 12 of Haviland Shasta and a partial set of Franciscan Starburst. Is there room in the support group? Replacements Ltd. in North Carolina has many colors of Fiesta, including discontinued ones — I got a bunch of persimmon (and turquoise) from them a couple of months ago. Good prices and excellent service. I also have a huge amount of Franciscan Desert Rose, the old ones made in California, inherited from my mother-in-law. Even the rose-shaped salt-and-pepper. Hi Pam…I know it’s been a couple months now since you posted all this fabulous Fiesta info but I’m so completely head over heels in love with Fiesta that I had to comment! I started collecting it in the early 90’s and I never get tired of admiring my beautiful dishes. As a matter of fact, when I recently moved in to my new 1950 house and filled up the original kicthen cabinets, I had to take pictures of how great all that Fiesta looked! My main color pallette is retired colors…sea mist, rose, yellow, persimmon, and turquoise (the only one not retired). I’ve added some scarlet and tangerine but they don’t seem to fit in quite right with my other colors. Persimmon is my all time fav…the color seems to bring out the concentric circle patterns. I wish they’d bring it back! I’m glad turquoise is still out there so I can buy the ocassional cute serving piece. I am absolutely going to check out flamingo and will likely be buying some since I’m an addict and can’t help myself! By the way, I only have one cracked bowl in my entire collection of 12 place settings and many serving pieces…Fiesta is some strong stuff! The owner of a 1950’s house down the street wants to sell 191 pieces of his vintage Fiestaware for ~$2K. I don’t collect Fiestaware, but I know that others do. If you’re interested, respond her and I’ll put you in touch with them.